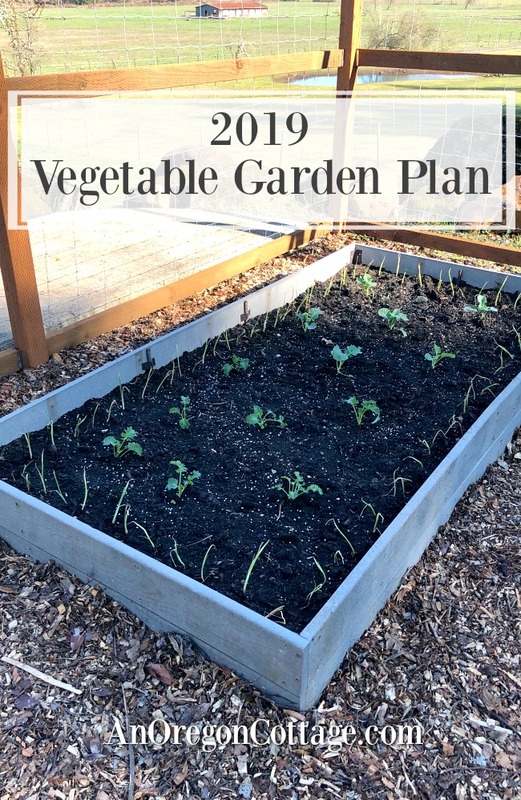 A raised bed vegetable garden plan with planting guide for a medium-sized garden to provide fresh food all season as well as extra to preserve for winter. Also, see how our new farmhouse deer-proof garden is coming together! It’s kind of a crazy time at the farmhouse. We’ve got the work on the interior, but the calendar is saying “it’s time to start planting” so our focus needs to turn outside for a bit here. But of course, it’s not as simple as just planting – yet. It will be in the future, though, once we get the foundation of the raised bed vegetable garden built. In fact, this is what often gets people tripped up in the beginning of starting a vegetable garden – it just seems easier to till that grass under, add soil and compost and plant already! The problem is just a few weeks down the road (literally weeks…), the weed seeds you’ve brought to the surface will get the sun they needed to grow and they will GROW. Often faster than the vegetable seeds you planted. And this will just continue through the summer as you water the vegetables and weeds. Until you get tired of weeding and give up around August, letting the weeds take over as your enthusiasm for the gardened has waned. Minimizing weeding, however, is just one of the reasons I like raised beds (TIP: even larger beds can be raised, as you can see in my previous raised bed garden). I list the other reasons it’s a great idea to plant in raised beds here. You can get all my tips and techniques, plus a huge selection of printable resources, in the Vegetable Gardening The Easy Way ebook! 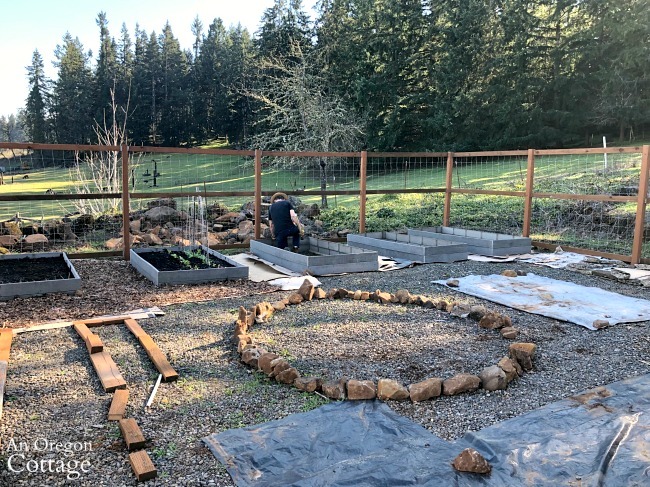 So, we are building a raised bed garden in a roughly 40′ x 40′ area we had on our property that previously housed a hardship mobile home (that’s why you’ll see the gravel base – but it’s FULL of weeds, so we’re covering it up). Once the foundation of the garden is finished, maintenance will be mainly a yearly refreshing of the bark chip paths, adding a layer of compost to the beds, planting, harvesting, and removing spent plants. Top row of beds: 4 beds at 4′ x 8′ each, which will hold many of our main crops each year, rotating to keep diseases at bay (an organic principle). 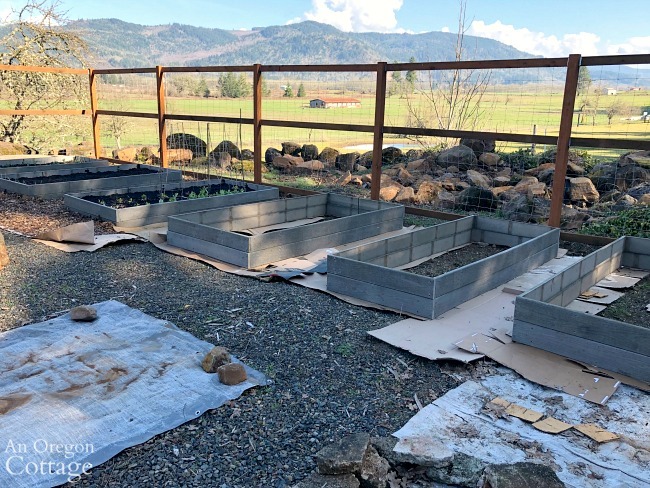 The 2 beds on the right will be smaller at 3′ x 8′ and will hold permanent plantings of Triple Crown Thornless Blackberries and everbearing raspberries. Middle Row Long Beds: 4 long and narrow beds (2′ x 12′), which I was inspired to add after visiting my aunt’s garden last year. 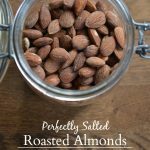 They will be perfect for tomatoes and beans – and I’m even going to try a couple rows of corn in one! Middle row circle: This bed will be built with rocks from our property to be about one foot high. At about 6′ x 6′, the center will hold a tall vining flower trained up an old bird feeder that was left on the property. Around the edges will be a mixture of bug-repelling flowers and herbs and vegetables. Area below the beds (“bottom area?” lol): This is the main addition to last’s year’s plan – as I was laying out the beds in the area, this mysterious 6 foot of extra space between the middle row and the fence “appeared.” Uh, math and I don’t get along well, it seems! 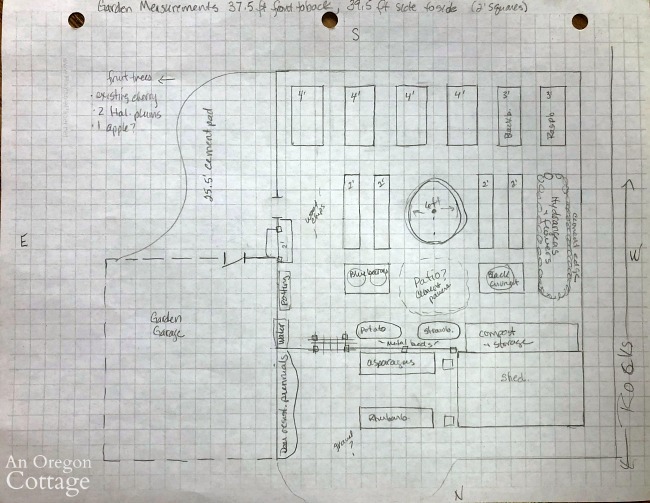 Anyway, there will be two 4′ x 6′ beds that will hold permanent plantings of blueberries and black currant. In between those will be a round patio area made with “urbanite” (i.e., the broken concrete from all the old cracked patios and walkways we had to remove) where we will put a couple of chairs to enjoy both the garden and the view. Lower fence area: 2 metal planters will hold potatoes and strawberries and our compost area will be next to the shed. Outside the deer fence: I will grow permanent beds of asparagus and rhubarb here since the deer tend to leave these two crops alone. We’ll see, but for now that’s the plan. Rhubarb leaves are poisonous, so I think they’ll be okay, but the tender spring shoots of asparagus, I’m not sure about. I can move them inside if it’s an issue. Oh, I almost forgot my hydrangea bed! In order to have enough to bring inside and dry, I’ll have to grow these in the deer fence, so I made room for an oval bed on the right made with more urbanite for hydrangeas and any other flower I want to grow that may be eaten. I’m thinking all add a couple roses here, too. The middle circle is laid out with the first layer of rocks – it will have about three layers total, I think. I don’t really know how to make rock walls, I’m just winging it with what I have, using dirt on one side to hold the rocks in place. I may use an adhesive for this circle, though. 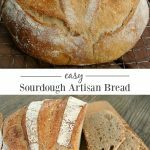 Still working that out (if you have any tips or knowledge, let me know!). You can see Brian in the back row securing the raised beds to the ground. 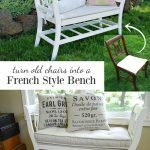 Here’s the tutorial we made showing how to make long-lasting beds like these. The long beds (laid out above with pieces of wood left from building the fence) will also be made like that. And you can see how covering the weedy gravel with cardboard and wood chips makes it look so neat and tidy. I love it! Here’s another shot of the beds in-progress. If you’re wondering how we fill those foot-tall beds without having to pay for a TON of soil, I give all the details in that tutorial, too. Okay, so that’s the background and the progress we’ve made so far. 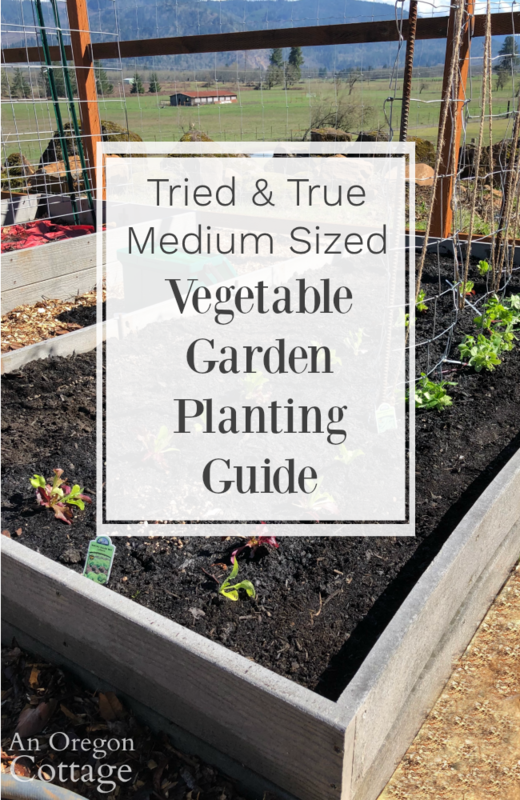 Now onto the vegetable planting plan for this year, including the varieties I’m growing and the amounts for this medium-sized vegetable garden. 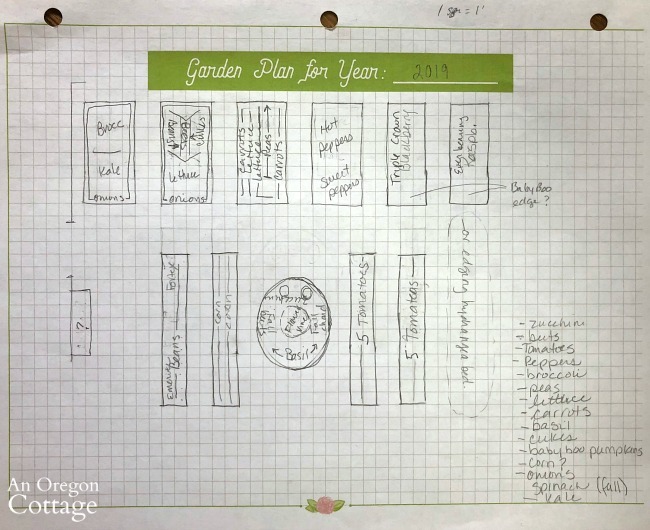 Above is the guide I used to plan out what to plant and where – you can grab this planning sheet by subscribing to the weekly newsletter to gain access to the VIP library where you’ll find the Garden Success Planning Notebook, which includes this sheet as well as many more garden planning helps. Also note: Planting times below are for my zone 8 garden – adjust for your zone. Lettuce: one 10-foot row of Bistro Salad Mix seedlings (one 6-pack broken apart into 12 starts) + 2 rows of seeded lettuce: Winter Density Romaine (winter density ) & Buttercrunch. 6 Broccoli starts (in a 4×4′ area – half the raised bed with onion border): Artwork broccoli (a new variety I’m growing known for season-long side shoot production). Onions: Wall Walla seedlings lining one bed and Red Onion sets lining another bed (so 24′ total onions around each bed). TIP: plant seedlings and sets closer together (about 2-3″ apart) and harvest green onions when you’re thinning the onions. It’s a way to get more food from a smaller area. Carrots: one 8-foot row of Purple Sun (pelleted seed for easy planting and less thinning! ), one 8-food row of Red Core Chantenay, and another of Tendersweet. Beets: one 4-foot row of Chioggia, and one 4-foot row of Cylindra (I’m the only one in my family who likes beets, so I don’t grow as much and what I do, I roast and freeze to use for lunch salads). 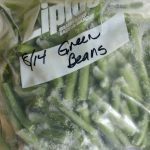 Pole Beans: 10-feet of my favorite pole bean, Emerite and 4 feet of Fortex, my go-to to compliment Emerite. Tomatoes: 2 Brandywine heirloom, 2 Cherokee Purple heirloom, 2 Early Girl hybrid, 1 Black Cherry heirloom (BEST flavor ever), and 3 Roma/Paste. These 10 plants will go into 2 12-foot beds and should produce enough for lots of fresh eating as well as salsa, addictive chutney, pizza sauce, and some dried tomatoes in olive oil. Pumpkins: Baby Boo and Jarrahdale (in hydrangea bed) – just what I can fit in here and there, since I grow them just for fall decor! 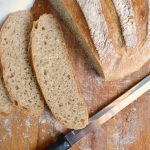 This amount will provide enough for fresh eating all season long, plus plenty for freezing, canning, and drying for a family of 3 to 4. Not as much as I used to grow in my larger cottage garden, but more manageable for me now that we are a 2-3 person household (depending on if our daughter is with us or not). 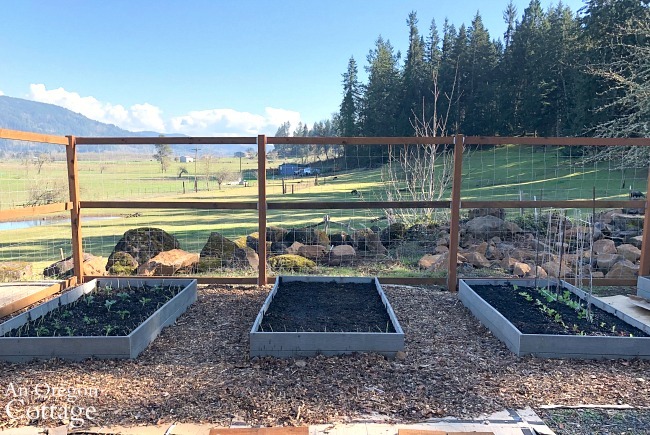 Above are the three beds that were planted late March: kale and broccoli lined with onion seedlings on the left, rows of lettuce seeds and beet seeds lined with onion sets in the middle, and snap peas, lettuce stars and seeds, and carrots seeds on the right. So that’s the the plan for our veggie garden this year – what about yours? What varieties are you growing that are your favorites? Jamie- what a beautiful and bountiful garden! I LOVE LOVE LOVE garden tours. Thank you so much for the tour of your awesome garden. I just planted carrots, snap peas, snow peas, blue lake, dill, and pinto beans outside. I did a little experiment with onions this year: I planted seeds last August and then transplanted the seedlings outside in October. They are growing nicely and made it through the winter. I also have garlic (planted in October), mustard greens, kale, and lettuce growing outside as well. Inside I have lots of tomato seedlings, sweet and hot peppers. Out in the greenhouse I have echinachea, cactus flowered zinnia, Scarlet red zinnia, Daisy, cilantro, clarckia, snap dragon, larkspur, heliotrope seedlings. I still have to start zucchini, delicata, pumpkin, cucumbers, and melons. I can’t wait to see pictures of your garden as it grows and fills in. Your garden sounds so bountiful! That onion planting is how they grow Walla Walla onions here in the PNW to get onions in June-July – hope that works for you, too. It really all depends on the weather. The year I tried that, we had warmer-than-normal temps in spring and many of the onions went to seed before forming heads. 🙁 So I didn’t really try again, ha! I love looking at other’s gardens, too!